Rich in tradition, the Cooke family of Dublin has been serving hearty fresh fish battered in a secret family recipe for generations. Now is your opportunity to try it state-side, with a hearty helping of chips! 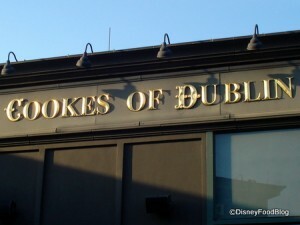 Located next to Raglan Road restaurant in Disney Springs, Cookes of Dublin offers traditional Irish entrees in a quirky quick service format. Traditionalists will be interested in the popular Original One & One entree which is hand battered fresh fish and chips served with tartar sauce. Guests seeking healthier dining options are offered several salads and lighter side items. A limited amount of outdoor and indoor seating is available. Traditional Irish fare; beef and lamb pie, chicken and field mushroom pie, smoked haddock pie, as well as battered fish & chips are featured. Battered chicken on skewers, Atlantic scallops, mini battered sausages, and side orders of chips are also available. Children have the choice of baby sausages and chips, fish & chips, or battered chicken with chips. If the wait for a table Raglan Road is too long, Cookes of Dublin is a quick and tasty alternative. Grab a pint at the well-stocked Raglan Road bar and enjoy a quick meal next door at this unique counter service restaurant.